This year marked the 160th anniversary of Our Lady appearing to young Bernadette Soubirous. Pilgrims have being travelling to Lourdes ever since and the Missionary Oblates of Mary have also been part of this Sacred Story and Journey. This September, the Oblates travelled to Lourdes with people from across Ireland, England Scotland, Wales and the Channel Isles. There are two primary Christian symbols to be experienced while in Lourdes; water and light. In John’s gospel we read that Jesus, tired by the journey, sat by a well. He sat down to rest himself. In a similar way perhaps, those who travelled to Lourdes did the same. We all arrived tired and carrying our own crosses; some very visible, some invisible. We came to Lourdes at the invitation of Mary who points and leads us to Jesus her Son who offers life-giving and healing water; he himself is the Water of Life. Through the healing and ancient water of Lourdes we are restored, renewed and refreshed. The buying and lighting of candles in Lourdes is also an ancient tradition. People lit candles as they prayed for those who asked to be remembered at the Grotto. Our pilgrimage in Lourdes was a time of Christian community. While we were there we were not just there on our own. We were surrounded by others who were praying with and for us. Our Assisted Pilgrims were cared for with love and compassion by Oblate Hospitality Groups including our Youth Service, our medical staff, our Handmaids and by so many others. Our Pilgrimage was truly a living and vibrant example of what it means to be The Body of Christ. Everyone who was there had a part to play and the Pilgrimage would not have been the same without them. In fact, the Pilgrimage could not have been such a success without them. We are so grateful and indebted to all those who freely gave of their time, talents and energy to be part of our experience in Lourdes this year. The message of Lourdes this year was taken from the gospel of the Wedding Feast of Cana when Mary simply said to servants, ‘Do whatever he tells you.’ Jesus told and showed us that he came to serve and not be served. He bent low, took the place of a slave and washed our feet and asks us to follow his example. 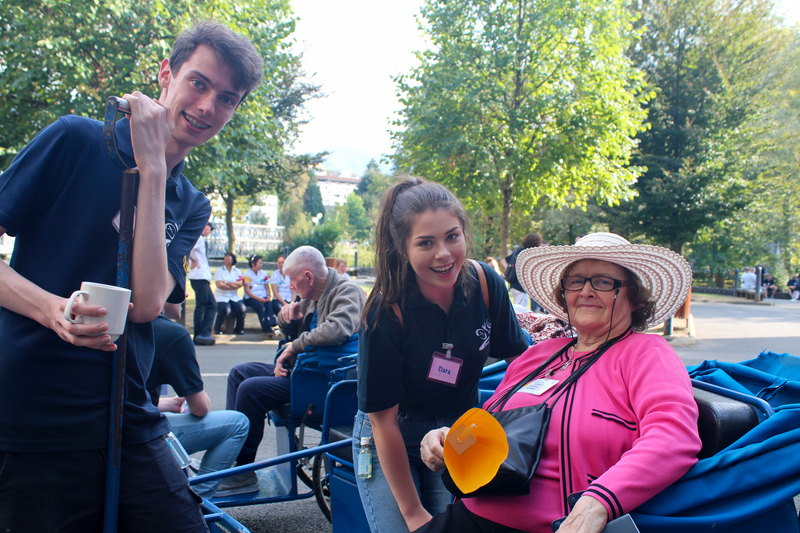 At the end of every mass, we are sent out with these words, ‘Go now to love and serve the Lord.’ This year, as always, we saw love and service in action every moment of our time in Lourdes. Having returned home, may we now continue to hear what Mary says to us, may we do whatever Jesus tells us to do as we love and serve each other in ours homes, our families, our work places, our parish communities and neighbourhoods. To see more photos from our pilgrimage to Lourdes, visit the Anglo-Irish Oblates facebook page here.